Converter or Transformer? Which one to Choose for Overseas Electricity? The voltage supplied in electrical outlets throughout the world varies according to countries. Countries in North America, parts of central and South America, the Caribbean and parts of pacific operates at 110V, while the rest of the world operates at 220Volt. In general 110 volt includes voltage range of 100-125V and 220 volt includes 220-240 volt. Many of the countries operate on both 110V-220V. This creates complication for travellers who pack electronic devices and personal appliances. The key solution is to pack Travel Voltage converter or transformer for every electrical situation. Converters and transformer change the voltage of electricity to match the voltage ofstep-up step-down voltage converter/transformer are almost similar, but there’s a difference. Converters are used with electric products and are not designed for continuous duty cycle. The device should only be used for short periods of time (1 to 2 hours). Whereas transformers are only used for electronic products. Single Voltage: Items having small voltage range, in-between 100-120 Volt, can accommodate small voltage fluctuations. Single voltage electrical devices such as hair dryer, iron can use both converter and transformer. Dual Voltage: Dual voltage devices use a slash to differ the 2 voltages. You might have come across with latest hair dryers, toothbrushes, coffee makers, electric shavers, and tea kettles functioning at 120V/240V. These devices do not require converters or transformer to operate at any voltage. Multi Voltage: Multi voltage devices utilizes a dash for indicating the voltage range. Transformers and converters are also not needed for these items. Some common appliances working under 100-240Volt are smartphones, battery charger, laptops, MP3 player, e-readers, camera, etc. Transformer and converter are used to protect your device from burning or short circuiting. You always need it to power up devices overseas. Pack a plug adapter in Canada, Brazil. 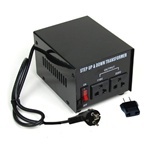 Use a 220- to 240-volt transformer adapter when in all European, Eastern European and African countries. Plug in a 100-volt transformer adapter when traveling in Japan. Carry 220- to 240-volt transformers in South America. Follow the instruction to figure out what electronic accessories you will need to take on your trip.